A removable water-soluble N-heterocyclic carbene (NHC) ligand in aqueous media via host-guest interaction has been developed. We demonstrated representative olefin metathesis reactions in water as well as in dichloromethane. Via either host-guest interaction or extraction, the residual ruthenium (Ru) catalyst was as low as 0.14 ppm after the reaction. Kim, C., Chung, H. Heterogeneous Removal of Water-Soluble Ruthenium Olefin Metathesis Catalyst from Aqueous Media Via Host-Guest Interaction. J. Vis. Exp. (138), e58067, doi:10.3791/58067 (2018). A highly efficient transition metal catalyst removal method is developed. The water-soluble catalyst contains a newly-designed NHC ligand for the catalyst removal via host-guest interactions. The new NHC ligand possesses an adamantyl (guest) tethered linear ethylene glycol units for hydrophobic inclusion into the cavity of a β-cyclodextrin (β-CD) host compound. The new NHC ligand was applied to a Ru-based olefin metathesis catalyst. The Ru catalyst demonstrated excellent activity in representative ring-closing metathesis (RCM) and ring-opening metathesis polymerization (ROMP) reactions in aqueous media as well as organic solvent, CH2Cl2. After the reaction was complete, the lingering Ru residue was removed from the aqueous solution with the efficiency of more than 99% (53 ppm of Ru residue) by simple filtration utilizing a host-guest interaction between insoluble silica-grafted β-CD (host) and the adamantyl moiety (guest) on the catalyst. The new Ru catalyst also demonstrated high removal efficiency via extraction when the reaction is run in organic solvent by partitioning the crude reaction mixture between layers of diethyl ether and water. In this way, the catalyst stays in aqueous layer only. In organic layer, the residual Ru amount was only 0.14 ppm in the RCM reactions of diallyl compounds. The removal of the homogeneous organometallic catalysis from the product is an important issue in modern chemistry1,2. Residual catalyst causes not only a toxicity problem from its heavy metal element, but also an undesired transformation of product from its potential reactivity. Homogeneous catalyst provides many advantages, such as high activity, rapid reaction rate, and chemoselectivity3, however, its removal from the product is much more difficult than heterogeneous catalyst which is simply removed by filtration or decantation. The combination of the advantages of homogeneous and heterogeneous catalyst, i.e., homogeneous reaction and heterogeneous removal, represents important concept for highly reactive and easily removable organometallic catalyst. Figure 1 illustrated the working principle for homogeneous reaction and heterogeneous removal of the catalyst via host-guest interaction. Host-guest chemistry is noncovalent bonding molecular recognition between host molecules and guest molecules in supramolecular chemistry4,5,6,7,8. Cyclodextrins (CDs), cyclic oligosaccharides, are representative host molecules9,10,11,12, and they have been applied in broad fields of science such as, polymer science13,14, catalysis15,16, biomedical applications6,10, and analytical chemistry17. A guest molecule, adamatane, binds strongly to the hydrophobic cavity of β-CD (host, 7-membered cyclic saccharide) with high association constant, Ka (log Ka = 5.04)18. This supramolecular binding affinity is strong enough to remove residual catalyst complex from the aqueous reaction solution with solid supported β-CD. Among many catalysts that are eligible for the host-guest removal, Ru olefin metathesis catalyst was studied due to high practical utilities and high stability against air and moisture. The olefin metathesis reaction is an important tool in synthetic chemistry to form a carbon-carbon double bond in the presence of a transition metal catalyst19,20,21,22. The development of stable Ru olefin metathesis catalyst trigged the metathesis as a major field in synthetic chemistry (e.g., RCM and cross metathesis (CM)) as well as polymer science (e.g., ROMP and acyclic diene metathesis (ADMET)). In particular, the RCM synthesizes macrocycles and medium-sized rings that have been hard to construct23. In spite of synthetic utilities of Ru catalyzed olefin metathesis, complete removal of used Ru catalyst from the desired product is a major challenge for many practical applications24. For example, 1912 ppm of Ru residue was observed in ring-closing metathesis product after silica gel column chromatography25. Residual Ru may cause problems such as olefin isomerization, decomposition, colorization, and toxicity of pharmaceutical products26. International Conference on Harmonization (ICH) published a guideline of residual metal reagents in pharmaceuticals. The maximum allowed Ru level in pharmaceutical product is 10 ppm27. For these reasons, various approaches were tried to remove Ru residue from the product solution28,29,30,31,32,33. Also, the developments of removable Ru catalysts have been studied for purification without any special treatment after the reaction. Among various purification methods, catalyst ligand modifications were tried to improve efficiency of silica gel filtration and liquid extraction. For example, highly efficient silica gel filtration can be achieved by introduced ion tag on benzylidene34 or backbone of NHC ligand35,36. The catalyst bearing poly(ethylene glycol)37 or ion tag35 on a NHC ligand can improve the efficiency of aqueous extraction for Ru catalyst removal. Recently, we reported a highly water soluble Ru olefin metathesis catalyst, which demonstrated not only high reactivity, but also high catalyst removal rate. Moreover, the metathesis and catalyst removal occurred in both water and dichloromethane34,35,36,37. The key feature of new catalyst is that the new NHC bears adamantyl tethered oligo(ethylene glycol). Oligo(ethylene glycol) provides high water solubility of the entire catalyst complex. In addition, the oligo(ethylene glycol) possesses adamantyl end group that can be used in host-guest interaction with external β-CD. Herein, we described the protocols for catalyst synthesis, metathesis reactions, and catalyst removal in both water and dichloromethane. Note: We presented the synthesis of 4-(97-(adamantan-1-yloxy)-2,5,8,11,14,17,20,23,26,29,32,35,38,41,44,47,50,53,56,59,62,65,68,71,74,77,80,83,86,89,92,95-dotriacontaoxaheptanonacontyl)-1,3-dimesityl-4,5-dihydro-1H-imidazol-3-ium tetrafluoroborate (imidazolium salt A) and host complex, β-CD grafted silica, in our previous paper38. In the protocol, we describe a synthesis of our water-soluble Ru olefin metathesis catalyst and metathesis reactions (RCM and ROMP). Dry a 25 mL round-bottomed flask with a stirring bar, a 20 mL vial, and a spatula in oven. Put 118 mg of imidazolium salt A (0.060 mmol) in a 4 mL vial. Place the prepared imidazolium salt A in dried glassware, a septum and the spatula in a glove box chamber and vacuum for 2 h.
After completely removing the air in glove box chamber, purge the inert gas into the chamber, then move them into the glove box. In the glove box, put 54 mg of Hoveyda-Grubbs (H-G) 1st generation (0.090 mmol, 1.5 equiv.) in a 20 mL vial. Dissolve the prepared imidazolium salt in 2.0 mL of toluene, then transfer it into the 50 mL round-bottomed flask with the stirring bar. Add 0.18 mL of potassium bis(trimethylsilyl)amide (KHMDS) solution (0.5 M toluene solution, 0.090 mmol, 1.5 equiv.) into the imidazolium salt solution. Swirl the flask to mix the reagents. Dissolve the H-G 1st generation in 3.0 mL of toluene, then add this solution into the reaction flask. Seal the flask with septum, then remove this from the glove box. Stir the reaction mixture for 3 h at 80 °C. After 3 h, purify the catalyst by chromatography on neutral alumina, eluted with EtOAc/MeOH = 15/1. Collect the dark green solution. Note: Evaporation of the solvent is not required before chromatography. Rf value is 0.46 on neutral alumina, eluted with EtOAc/MeOH = 15/1. Remove the solvent under reduced pressure. Vacuum the final residue to obtain dark green waxy solid. Prepare degassed deuterium oxide (D2O) or deionized water by bubbling D2O or deionized water with nitrogen gas over 2 h.
Put 4.4 mg of the catalyst 1 (0.0020 mmol) and 41 mg of 2-allyl-N,N,N-trimethylpent-4-en-1-aminium chloride (tetraalkyl ammonium substrate) (0.20 mmol) in each 4.0 mL vial. Dissolve the tetraalkyl ammonium substrate in 0.5 mL of degassed D2O (or H2O), then add the solution into catalyst 1. Seal the reaction vial, then heat the reaction mixture for 24 h at 45 °C. Monitor the reaction conversion by 1H NMR. NOTE: Monitor the 1H NMR peak conversion from 3.25 ppm (doublet, -NCH2CH- in substrate) to 3.52 ppm (doublet, -NCH2CH- in product). After the completion of the reaction, cool down the reaction vial at room temperature. Add 150 mg of β-CD grafted silica into the reaction mixture. Note: Grafted β-CD unit onto the silica gel was calculated in 1.57 10-4 mmol/mg by thermogravimetric analysis (TGA). Stir the reaction mixture for 10 h at room temperature. Filter the reaction mixture through cotton plug. Remove the solvent in a freeze dryer. Prepare degassed D2O or deionized water by bubbling D2O or deionized water with nitrogen gas over 2 h.
Put 4.4 mg of the catalyst 1 (0.0020 mmol) and 17.1 mg of 2-((3aR*,4S*,7R*,7aS*)-1,3-dioxo-1,3,3a,4,7,7a-hexahydro-2H-4,7-methanoisoindol-2-yl)-N,N,N-trimethylethan-1-aminium chloride (monomer, Figure 5) (0.060 mmol) in each 4.0 mL vial. Dissolve the monomer in 0.5 mL of degassed D2O (or H2O), then add the solution into catalyst 1. Seal the reaction vial, then heat the reaction mixture for 2 h at 45 °C. Monitor the reaction conversion by 1H NMR. NOTE: Monitor the 1H NMR peak disappearance at 6.14 ppm (-CH=CH- in monomer). Quench the reaction with 0.1 mL of ethyl vinyl ether. Note: Quenching is necessary to dissociate Ru catalyst from polymer chain terminal. Put 4.4 mg of the catalyst 1 (0.0020 mmol) and 48 mg of diethyl diallylmalonate (0.20 mmol) in each 4.0 mL vial. Dissolve the diethyl diallylmalonate in 0.5 mL of CH2Cl2, then add the solution into catalyst 1. Seal the reaction vial, then keep the reaction mixture at room temperature for 1 h. Monitor the reaction conversion by 1H NMR. Note: Monitor the 1H NMR peak conversion from 2.63 ppm (doublet, -CCH2CH=CH2 in substrate) to 3.01 ppm (singlet, -CCH2CH=CHCH2C- in product). After the completion of the reaction, transfer the resulting reaction mixture into a 30 mL vial. Dilute the reaction solution with 15 mL of diethyl ether. Wash the organic solution with 15 mL of water for five times. Dry the organic layer with MgSO4, then filter the solution through cotton plug to remove MgSO4 particles. Add 60 mg of activated carbon into the resulting solution, then stir the mixture for 24 h at room temperature. Filter the solution through cotton plug to remove activated carbon, then remove the solvent under reduced pressure. Figure 2 describes the ligand exchange reaction for our catalyst 1. The 1H NMR spectrum is shown in Figure 3. Figure 4 shows the RCM in aqueous solution and subsequent removal of used catalyst from the reaction mixture via host-guest interaction, and Table 1 summarizes RCM in aqueous media. Quaternary ammonium substrate was fully converted into corresponding product with 1 mol% of the catalyst 1, and the conversion was monitored by 1H NMR. After the metathesis reaction, the resulting reaction mixture was stirred with β-CD grafted silica gel for 10 h. As Figure 4 described, dark reaction solution turned clear after the host-guest removal. The resulting solution was filtered through a cotton plug, then the solvent was removed in a freeze dryer. The residual Ru level of the product was analyzed by inductively coupled plasma mass spectrometry (ICP-MS), and 53 ppm of residual Ru was detected from the final product (Table 1, entry 1). In entry 2, the same protocol was applied to primary ammonium substrate. 3 mol% of catalyst loading provided complete conversion, and the residual Ru level in this product was 284 ppm. ROMP in aqueous solution is described in Figure 5. After the removal of catalyst, residual Ru was analyzed by ICP-MS. Figure 6 describes the demonstration of RCM reaction in CH2Cl2 and the removal of used catalyst from reaction mixture via extraction, and Table 2 shows the scope of RCM in CH2Cl2. After the reaction, used catalyst was removed by extraction and subsequent treatment with activated carbon. Except highly hindered substrate (Table 2, entry 3), the substrates demonstrated complete conversions with 1 mol% of catalyst 1. After metathesis reaction in CH2Cl2, the reaction mixture was diluted with diethyl ether. The diluted organic solution was extracted with water for five times. As shown in Figure 6, the clear solution was obtained after the extraction. After the extraction, activated carbon was added into the dried organic solution, then the solution was stirred for 24 h. The activated carbon was removed by filtration, and the resulting solution was concentrated under reduced pressure. The residual product was analyzed by ICP-MS to measure the residual Ru level, and 5.9 ppm of Ru was detected from the product. Without activated carbon treatment, the residual Ru level was 63 ppm, and this value is not acceptable for pharmaceutical purpose (Table 2, entry 1). Figure 1. Illustration of the concept for heterogeneous catalyst removal of homogeneous catalyst via host-guest interaction. This figure has been modified from Organic Letters. 20 (3), 736 - 739, doi: 10.1021/acs.orglett.7b03871 (2018). Please click here to view a larger version of this figure. Figure 2. Synthesis of catalyst 1 from imidazolium salt A. NHC ligand was generated by deprotonation from imidazolium salt A, then ligand exchange reaction was followed to form a catalyst 1. Please click here to view a larger version of this figure. Fugure 3. 1H NMR spectrum of catalyst 1 and its assignment. 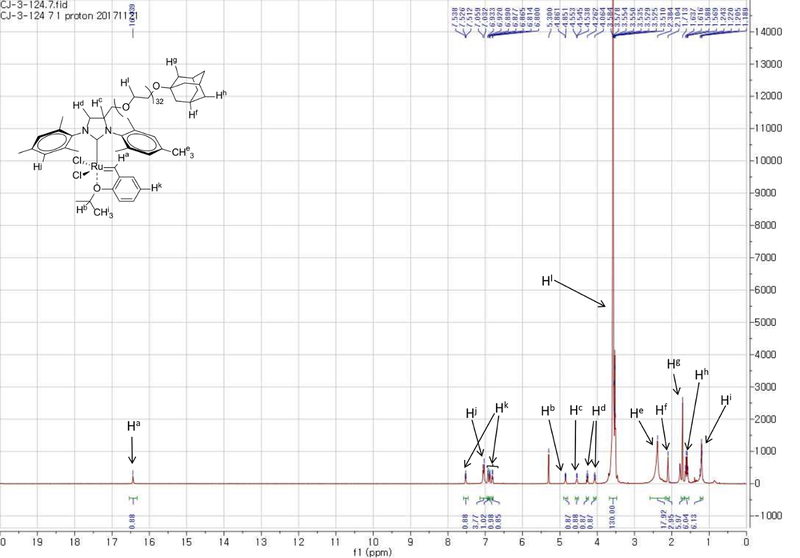 1H NMR (600 MHz, CD2Cl2) δ 16.44 (s, 1H, Ha), 7.53 (t, J = 7.8 Hz, 1H, Hk), 7.05 (d, J = 16.2 Hz, 4H, Hj), 6.93 (d, J = 7.8 Hz, 1H, Hk), 6.88 (t, J = 7.5 Hz, 1H, Hk), 6.81 (d, J = 8.4 Hz, 1H, Hk), 4.90 - 4.79 (m, 1H, Hb), 4.59 - 4.50 (m, 1H, Hc), 4.26 (t, J = 10.8, 1H, Hd), 4.06 (t, J = 8.7 Hz, 1H, Hd), 3.67 - 3.48 (m, 130H, Hl), 2.59 - 2.18 (m, 18H, He), 2.10 (s, 3H, Hf), 1.71 (d, J = 3.2 Hz, 6H, Hg), 1.60 (dd, J1 = 28.5 Hz, J2 = 12.3 Hz, 6H, Hh), 1.24 - 1.17 (m, 6H, Hi). Please click here to view a larger version of this figure. Figure 4. Host-guest removal of Ru catalyst after RCM in aqueous media (Table 1, entry 1). (a) Beginning of reaction at t = 0 (mixture of catalyst 1, substrate, and solvent D2O). (b) Completed reaction at t = 24 h. (c) Addition of β-CD grafted silica into the reaction mixture. (d) Resulting solution after 10 h stirring. (e) Filtration of resulting solution; the dark Ru catalyst residue was removed by filtering. The resulting purified solution is colorless in the vial. Please click here to view a larger version of this figure. Figure 5. ROMP in aqueous media. This figure has been modified from Organic Letters.20 (3), 736 - 739, doi: 10.1021/acs.orglett.7b03871 (2018). Please click here to view a larger version of this figure. Figure 6. RCM in CH2Cl2 and removal of catalyst 1 (Table 2, entry 1). (a) Beginning of reaction at t = 0 (mixture of catalyst 1, substrate, and solvent CH2Cl2). (b) Completion of reaction at t = 1 h. (c) Dilution with additional 15 mL of diethyl ether; a dark catalyst residue was dispersed in the solution. (d) Aqueous layer only after 1st extraction. A large amount of water dissolved catalyst was removed from an organic layer. (e) Phase separation after 2nd extraction (upper layer: organic with product only, lower layer: aqueous with catalyst). (f) Organic layer after 5th extraction. There is no visual appearance of dark catalyst in the organic layer. Please click here to view a larger version of this figure. Figure 7. Illustration of overall host-guest removal process after metathesis reaction in aqueous media. This figure has been modified from Organic Letters. 20 (3), 736 - 739, doi: 10.1021/acs.orglett.7b03871 (2018). Please click here to view a larger version of this figure. Table 1. 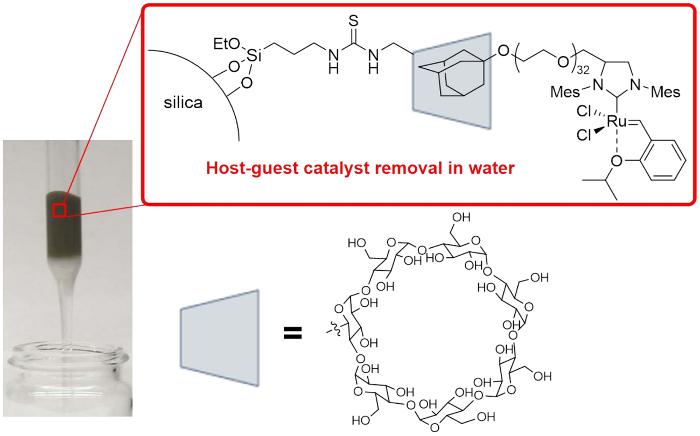 RCM in aqueous media and removal of used catalyst via host-guest interaction. Reaction condition: 45 °C in D2O for 24 h. Residual Ru level in product was analyzed by ICP-MS; the detailed ICP-MS analysis process is described in supporting information of previous report38. This table has been modified from Organic Letters. 20 (3), 736 - 739, doi: 10.1021/acs.orglett.7b03871 (2018). Table 2. RCM in CH2Cl2 and removal of used catalyst via extraction and treatment with activated carbon. Reaction condition: 40 °C with 1 mol% of catalyst 1 in CH2Cl2 for 1 h. Residual Ru level in product was analyzed by ICP-MS. Entries 1 and 4 were carried out at room temperature. aThe extracted crude product was filtered through a silica pad without activated carbon treatment. This table has been modified from Organic Letters. 20 (3), 736 - 739, doi: 10.1021/acs.orglett.7b03871 (2018). We described the synthesis of removable homogeneous Ru olefin metathesis catalyst and its removal from both aqueous and organic solutions. Homogeneous catalysis provides many benefits compared to heterogeneous catalysts, such as high reactivity and rapid reaction rate; however, the removal of the used catalyst from the product is more difficult than heterogeneous catalyst3. The key feature of synthesized catalyst is the NHC ligand, which bears adamantyl tethered water soluble oligo(ethylene glycol). The presented catalyst demonstrated the homogeneous reactions in both aqueous and organic solutions, and the residual Ru was easily removed by filtration utilizing a host-guest interaction4,5,6,7,8 and liquid extraction. Figure 7 describes a removal of used catalyst via host-guest interaction after metathesis reaction in water solution. After complete conversion with homogeneous catalysis in high reactivity and rapid reaction rate, host complex was added to the reaction mixture to form a heterogeneous host-guest complex between β-CD on host and adamantane moiety on our catalyst 118. After filtration of the resulting solution, more than 99% of residual Ru was removed from the product (Table 1, entry 1). As shown in Table 1, synthetically useful primary ammonium salt substrate was fully converted into corresponding product with a catalyst loading, 3 mol% of catalyst (entry 2). The residual Ru of this primary ammonium product was 284 ppm after filtration, which means that 98.7 % of used Ru was removed by host-guest interaction. The reason for higher catalyst loading and residual Ru level than the reaction with quaternary ammonium may be the coordination between the Ru metal and nitrogen in primary ammonium after ionization in water. Furthermore, Figure 5 describes ROMP of water-soluble monomer with our catalyst in aqueous media, and the polymer was obtained in quantitative yield with 269 ppm of residual Ru, which means 97.7% of Ru was removed. In ROMP reaction, quenching with ethyl vinyl ether is important to liberate the Ru catalyst from polymer chain. Additionally, our catalyst demonstrated high reactivity in CH2Cl2 with commonly used RCM substrates (Table 2). Hindered substrate in entry 3 was only provided trace amount of product, and other substrates was fully converted into desired products. As shown in Figure 6, most of residual Ru was removed by aqueous extraction. After filtration with extracted product through silica pad, 63 ppm of residual Ru was observed (entry 1). Activated carbon treatment with extracted product provided excellent removal rate of used Ru catalyst37, which were less than 10 ppm, the pharmaceutically acceptable Ru limit in product27. Because of the decomposition of catalyst 1 during/after metathesis reactions39, the recycling of the catalyst was not possible. Because host-guest interaction is a reversible process4,5,6,7,8, the reversibility of the reported NHC ligands will be studied to develop fully recyclable organometallic catalysis system40 as the ultimate goal of this line of research. In addition, the reported homogeneous catalyst system can be further applied to a large scale metal scavenging method. After a desired large scale chemical reaction, the guest-tagged catalyst can be completely removed by passing the product solution through host-tagged solid packed cartridge. This work was supported by the Florida State University Energy and Materials Hiring initiative and the FSU Department of Chemical and Biomedical Engineering. Hoveyda-Grubbs Catalyst 1st Generation Sigma-Aldrich 577944 Air sensitivie. Light sensitivie. Ethyl vinyl ether Sigma-Aldrich 422177 Air sensitive. Potassium bis(trimethylsilyl)amide solution (0.5 M in toluene) Sigma-Aldrich 277304 Moisture sensitive. Etyhl acetate VWR BDH1123 Flammable liquid. Methanol VWR BDH1135 Flammable liquid. Toxic. Methylene Chloride-D2 (D, 99.8%) Cambridge Isotope Laboratories, Inc. DLM-23 Flammable liquid. Toxic. Ethyl ether EMD Millipore EX0190 Flammable liquid. Allen, D. P. Handbook of Metathesis. Wiley-VCM, Weinheim. Chapter 5 (2015). Vougioukalakis, G. C. Removing Ruthenium Residues from Olefin Metathesis Reaction Products. Chemistry-A European Journal. 18, (29), 8868-8880 (2012). Hartwig, J. F. Organotransition Metal Chemistry: From Bonding to Catalysis. University Science Books, Sausalito. Chapter 14 (2010). Lehn, J. M. Toward complex matter: Supramolecular chemistry and self-organization. Proceedings of the National Academy of Sciences of the United States of America. 99, (8), 4763-4768 (2002). Chen, G., Jiang, M. Cyclodextrin-based inclusion complexation bridging supramolecular chemistry and macromolecular self-assembly. Chemical Society Reviews. 40, (5), 2254-2266 (2011). Ma, X., Zhao, Y. Biomedical Applications of Supramolecular Systems Based on Host-Guest Interactions. Chemical Reviews. 115, (15), 7794-7839 (2015). Shetty, D., Khedkar, J. K., Park, K. M., Kim, K. Can we beat the biotin-avidin pair? : cucurbituril-based ultrahigh affinity host-guest complexes and their applications. Chemical Society Reviews. 44, (23), 8747-8761 (2015). Schmidt, B. V. K. J., Barner-Kowollik, C. Dynamic Macromolecular Material Design-The Versatility of Cyclodextrin-Based Host-Guest Chemistry. Angewandte Chemie International Edition. 56, (29), 8350-8369 (2017). Khan, A. R., Forgo, P., Stine, K. J., D'Souza, V. T. Methods for Selective Modifications of Cyclodextrins. Chemical Reviews. 98, (5), 1977-1996 (1998). Szejtli, J. Introduction and General Overview of Cyclodextrin Chemistry. Chemical Reviews. 98, (5), 1743-1754 (1998). Li, J., Loh, X. J. Cyclodextrin-based supramolecular architectures: Syntheses, structures, and applications for drug and gene delivery. Advanced Drug Delivery Reviews. 60, (9), 1000-1017 (2008). Crini, G. Review: A History of Cyclodextrins. Chemical Reviews. 114, (21), 10940-10975 (2014). Zhang, Z. X., Liu, K. L., Li, J. A Thermoresponsive Hydrogel Formed from a Star-Star Supramolecular Architecture. Angewandte Chemie International Edition. 52, (24), 6180-6184 (2013). Harada, A., Takashima, Y., Nakahata, M. Supramolecular Polymeric Materials via Cyclodextrin-Guest Interactions. Accounts of Chemical Research. 47, (7), 2128-2140 (2014). Ballester, P., Vidal-Ferran, A., van Leeuwen, P. W. N. M. Modern Strategies in Supramolecular Catalysis. Advances in Catalysis. 54, (1), 63-126 (2011). Raynal, M., Ballester, P., Vidal-Ferran, A., van Leeuwen, P. W. N. M. Supramolecular catalysis. Part 1: non-covalent interactions as a tool for building and modifying homogeneous catalysts. Chemical Society Reviews. 43, (5), 1660-1733 (2014). Szente, L., Szemán, J. Cyclodextrins in Analytical Chemistry: Host-Guest Type Molecular Recognition. Analytical Chemistry. 85, (17), 8024-8030 (2013). Fourmentin, S., Ciobanu, A., Landy, D., Wenz, G. Space filling of β-cyclodextrin and β-cyclodextrin derivatives by volatile hydrophobic guests. Beilstein Journal of Organic Chemistry. 9, 1185-1191 (2013). Astruc, D. Olefin Metathesis: Theory and Practice. John Wiley & Sons, Inc. Hoboken. Chapter 1 (2014). Samojłowicz, C., Bieniek, M., Grela, K. Ruthenium-Based Olefin Metathesis Catalysts Bearing N-Heterocyclic Carbene Ligands. Chemical Reviews. 109, (8), 3708-3742 (2009). Vougioukalakis, G. C., Grubbs, R. H. Ruthenium-Based Heterocyclic Carbene-Coordinated Olefin Metathesis Catalysts. Chemical Reviews. 110, (3), 1746-1787 (2010). Herbert, M. B., Grubbs, R. H. Z-Selective Cross Metathesis with Ruthenium Catalysts: Synthetic Applications and Mechanistic Implications. Angewandte Chemie International Edition. 54, (17), 5018-5024 (2015). Maier, M. E. Synthesis of Medium-Sized Rings by the Ring-Closing Metathesis Reaction. Angewandte Chemie International Edition. 39, (12), 2073-2077 (2000). Clavier, H., Grela, K., Kirschning, A., Mauduit, M., Nolan, S. P. Sustainable Concepts in Olefin Metathesis. Angewandte Chemie International Edition. 46, (36), 6786-6801 (2007). Cho, J. H., Kim, B. M. An Efficient Method for Removal of Ruthenium Byproducts from Olefin Metathesis Reactions. Organic Letters. 5, (4), 531-533 (2003). Skowerski, K., Gułajski, Ł Olefin Metathesis: Theory and Practice. John Wiley & Sons, Inc. Hoboken. Chapter 25 (2014). Committee for medicinal products for human use (CHMP). Guideline on the specification limits for residues of metal catalysts or metal reagents (Doc.Ref. EMEA/CHMP/SWP/4446/2000). European Medicines Agency. London. 1-34 (2008). Maynard, H. D., Grubbs, R. H. Purification technique for the removal of ruthenium from olefin metathesis reaction products. Tetrahedron Letters. 40, (22), 4137-4140 (1999). Paquette, L. A., et al. A Convenient Method for Removing All Highly-Colored Byproducts Generated during Olefin Metathesis Reactions. Organic Letters. 2, (9), 1259-1261 (2000). Ahn, Y. M., Yang, K., Georg, G. I. A Convenient Method for the Efficient Removal of Ruthenium Byproducts Generated during Olefin Metathesis Reactions. Organic Letters. 3, (9), 1411-1413 (2001). Westhus, M., Gonthier, E., Brohm, D., Breinbauer, R. An efficient and inexpensive scavenger resin for Grubbs' catalyst. Tetrahedron Letters. 45, (15), 3141-3142 (2004). McEleney, K., Allen, D. P., Holliday, A. E., Crudden, C. M. Functionalized Mesoporous Silicates for the Removal of Ruthenium from Reaction Mixtures. Organic Letters. 8, (13), 2663-2666 (2006). Galan, B. R., Kalbarczyk, K. P., Szczepankiewicz, S., Keister, J. B., Diver, S. T. A Rapid and Simple Cleanup Procedure for Metathesis Reactions. Organic Letters. 9, (7), 1203-1206 (2007). Michrowska, A., et al. A green catalyst for green chemistry: Synthesis and application of an olefin metathesis catalyst bearing a quaternary ammonium group. Green Chemistry. 8, (8), 685-688 (2006). Skowerski, K., et al. Easily removable olefin metathesis catalysts. Green Chemistry. 14, (12), 3264-3268 (2012). Kosnik, W., Grela, K. Synthesis of functionalised N-heterocyclic carbene ligands bearing a long spacer and their use in olefin metathesis. Dalton Transactions. 42, (20), 7463-7467 (2013). Hong, S. H., Grubbs, R. H. Efficient Removal of Ruthenium Byproducts from Olefin Metathesis Products by Simple Aqueous Extraction. Organic Letters. 9, (10), 1955-1957 (2007). Kim, C., Ondrusek, B. A., Chung, H. Removable Water-Soluble Olefin Metathesis Catalyst via Host-Guest Interaction. Organic Letters. 20, (3), 736-739 (2018). Hong, S. H., Wenzel, A. G., Salguero, T. T., Day, M. W., Grubbs, R. H. Decomposition of Ruthenium Olefin Metathesis Catalysts. Journal of the American Chemical Society. 129, (25), 7961-7968 (2007). Qi, M., Chew, B. K. J., Yee, K. G., Zhang, Z. X., Young, D. J., Hor, T. S. A. A catch-release catalysis system based on supramolecular host-guest interactions. RSC Advances. 6, (28), 23686-23692 (2016).